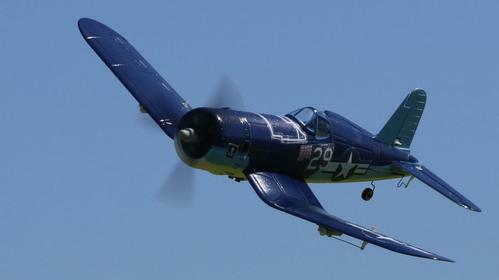 For Christmas, she bought me another step up in difficulty: the UMX F4U Corsair BNF with AS3X from E-flit. That’s a mouthful, but as you might have guessed, it’s an F4. And it’s TINY. The wingspan is less than 16″! The “AS3X” part of the name is a little on-board computer that helps keep the tiny plane from feeling too touchy. The net effect is that it flies like a much bigger plane as the computer seamlessly counteracts the effects of wind. This plane is small but it’s still a bit too fast to fly in our cul-de-sac. It’s a great one for a soccer field though and the schools down the street provide lots of flying opportunities for it. The tiny plane doesn’t skimp on the details. I took my own pictures but these photos from the marketing site are much better. Want to fly it sometime? I’d be happy to buddy box with you!